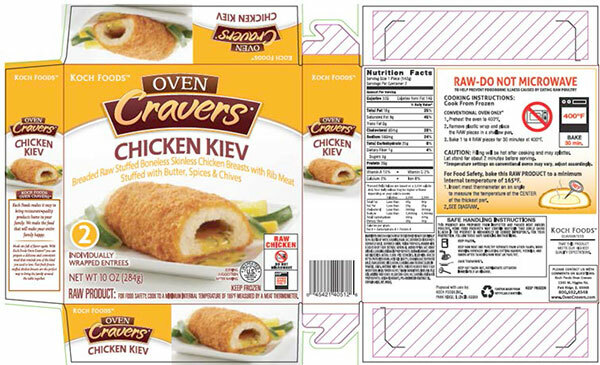 Consumers need to check their freezer again for the most recent recall on raw, stuffed chicken. The U.S. Department of Agriculture’s Food Safety and Inspection Service (FSIS) announced that frozen, raw, stuffed and breaded chicken products produced by Aspen Foods, a division of Koch Poultry Company, of Chicago, Illinois, have been confirmed as having the same Salmonella Enteritidis outbreak strain that was part of a July 15, 2015 recall. Following the earlier recall, FSIS has been conducting intensified sampling at this establishment to ensure that the hazard responsible for the initial contamination has been controlled by Aspen Foods. Results from the sampling revealed 12 positive results that match the outbreak strain of Salmonella Enteritidis to Aspen Foods products. Three illnesses were epidemiologically linked to the original recall on July 15, 2015. FSIS continues to work with public health partners including the Minnesota Departments of Health and Agriculture and the Centers for Disease Control and Prevention on this ongoing investigation. FSIS is concerned about all frozen, raw, stuffed and breaded chicken products produced by Aspen Foods between July 30, 2015 and September 17, 2015. The twelve positive samples collected during intensified sampling efforts alerted FSIS to a systemic problem at the establishment. FSIS cannot have confidence in the safety of any products produced after July 30, 2015. In addition to issuing this alert, FSIS has directed its personnel to detain products covered by this alert that they find in commerce because the company has refused to recall the products. These products were labeled with instructions identifying that the product was uncooked (raw) and included cooking instructions for preparation. As stated in the July 15, 2015 Recall Release, some case-patients reported following the cooking instructions on the label and using a food thermometer to confirm that the recommended temperature was achieved. Therefore, FSIS advises consumers not to eat these products. Special attention should be paid by the food service industry and food handlers. Using a food thermometer to properly cook these products will not protect the health of the consuming public. Consumers who have purchased these products are urged not to consume them. These products should be thrown away or returned to the place of purchase. FSIS is concerned that some product may be in consumers’ freezers. Although the products included in this Alert may appear to be cooked, this product is in fact uncooked (raw) and should be handled carefully to avoid cross-contamination in the kitchen.